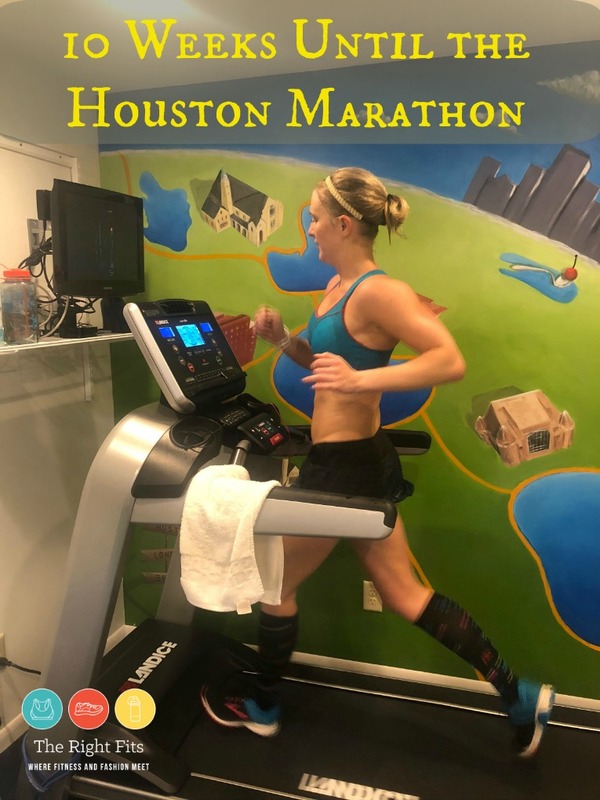 Another week, another weekly recap of training for the Houston Marathon! 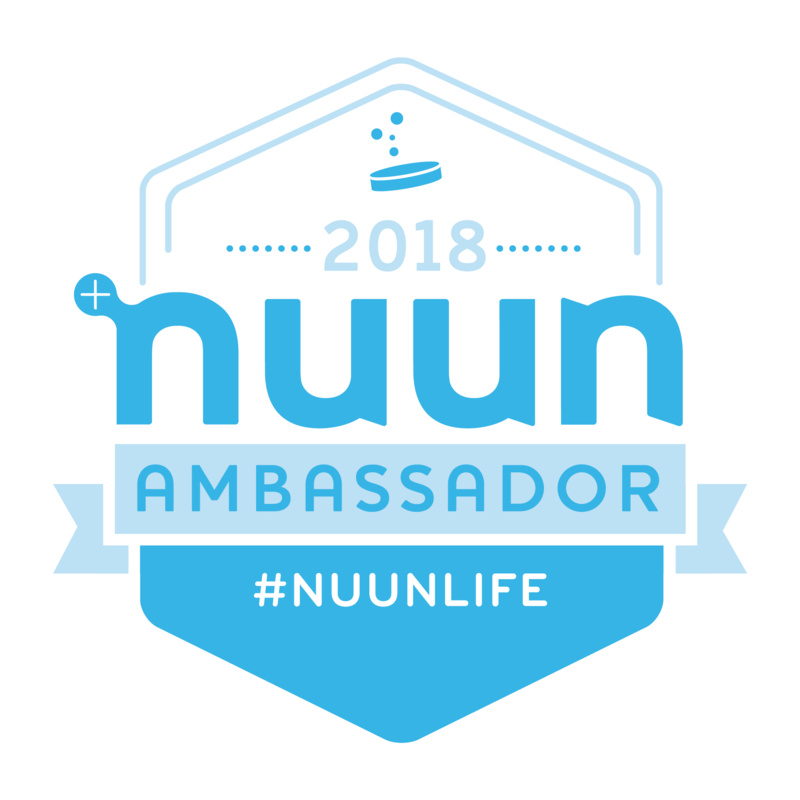 Time is flying by and there are just 10 short weeks until I run my 30th marathon at the end of January. *Quick note- if you only check in here for my weekly recaps, be sure to check out this post, the 3rd post about our trip to Norway- this time recapping our time in Bergen! 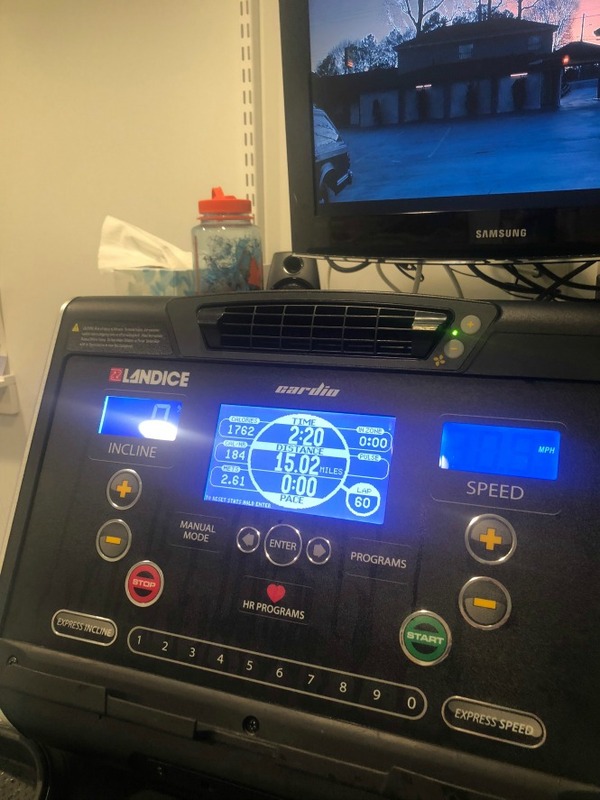 It was a rough patch for me and I think it definitely explains why I will be choosing the treadmill more often than not, as you’ll start to see in this recap. I’d rather run on the treadmill than not be able to run! Monday: 10.9 miles before work, outside, the only warm-ish day of the week. 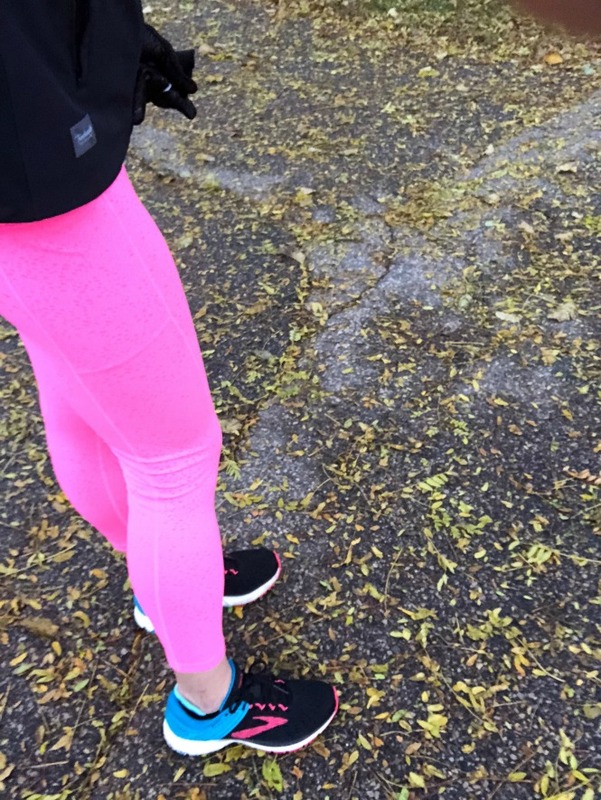 Rocked those bright Firecracker tights again. 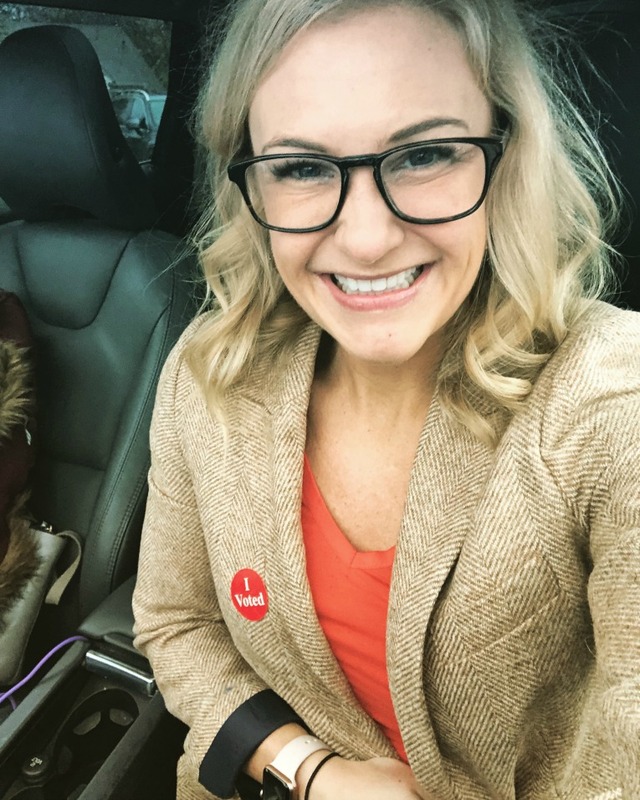 Tuesday: Rest day from running; had to make time before work to vote! 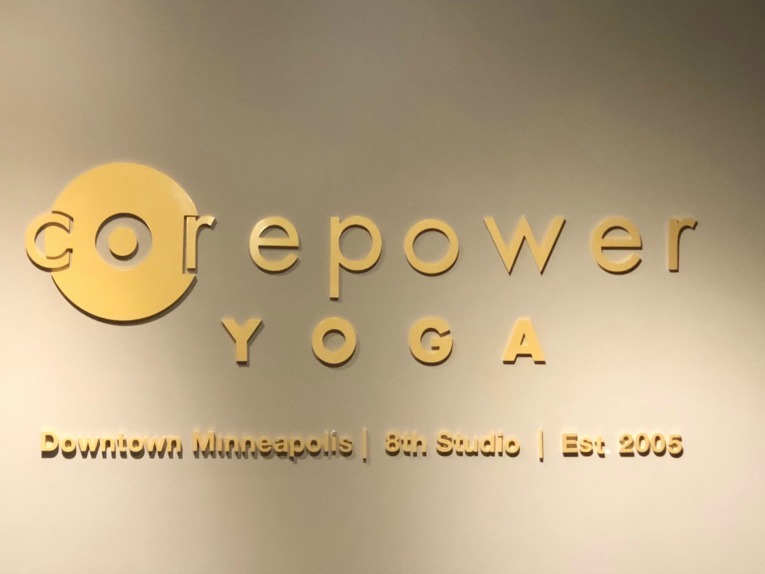 I went to Corepower Yoga after work for a vinyasa class. It was fantastic. Wednesday: I was supposed to have a speed workout; I headed outside to run and shouldn’t have. The trails were too slippery for this girl; I still ran, but I had so much anxiety and was going very slowly. I still ran the mileage outside (10.7 miles before work) but was way too nervous to speed things up. Kind of a bust and I wished I had run on the treadmill. A sad eye-opener that it’s already treadmill time in Minneapolis. Thursday: Though the day before was slippery, the trails fortunately had cleared by the morning, so I ran 8.3 miles to work. Only 20 degrees and windy, but clear paths, no ice. Friday: More snow = means more slippery. I opted for the treadmill, 5 miles. I actually don’t mind my treadmill set up in our basement. I have a TV right there that’s hooked up to an Apple TV, so I have HBO Go, Netflix, Hulu, whatever I want to watch. It’s not the same as running outside, of course not, but it’s not that bad. Saturday: I asked around to friends who had run outside on Friday and they said there were quite a few slippery spots. With that said, I decided to do my long run on the treadmill. Not taking any chances this year. 15 miles is a long way to run on the treadmill, but fortunately I had a workout to break it up a bit: 5 miles easy, 4 miles at an 8:40 min/mile pace, then 1 mile easy, then 5 x 0.2 mile at a 7:30 pace with 0.1 recovery in between, then another ~3-ish miles easy to get to 15 miles total. After the run, I quickly showered to head to the Dog Film Fest at the Riverview Theater with Dustin. It was a $5/ticket to see a few cute short films about dogs; definitely some tear-jerkers in there, but a fun event for dog lovers like myself. 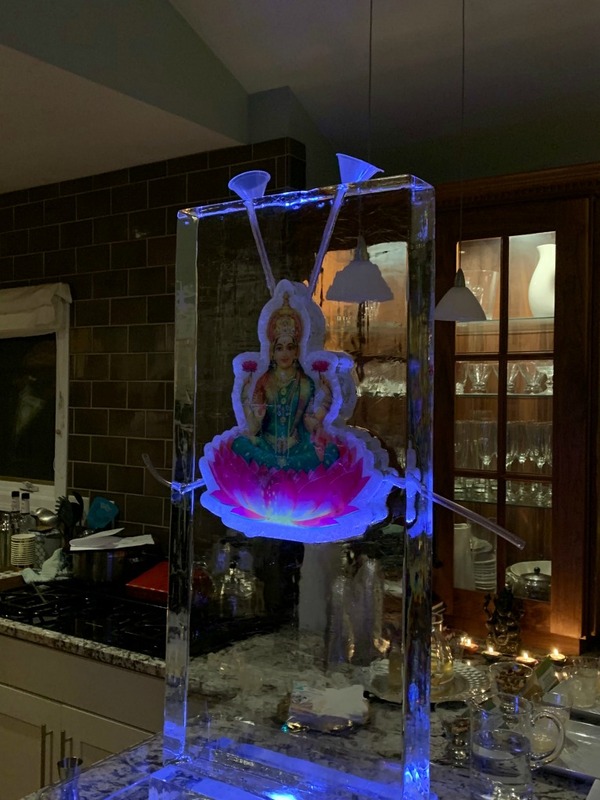 They even had this huge ice luge at the party for shots- I did not try it, but plenty of others did! Sunday: Lazy Sunday; I lounged around on the couch with a cup of coffee for awhile before finally heading to the basement for another 6 miles on the treadmill. Dustin ran outside with Tilda and said the trails weren’t that bad, so hopefully I’ll be back outside this week. It’s warming back up to the 40’s by the end of the week so fingers crossed for better conditions. Summary: 56 miles of running, 1 yoga class, no strength. Not a terrible week, but definitely have had better ones in training. My goal for next week is at least two non-running activities (yoga or strength!) in addition to all the running. Totally agree! Cold is one thing, but the slippery trails 🙁 No good. 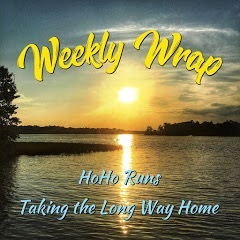 Excellent week of running, and wise choices on the TM. Its frustrating that winter weather is here so early – I feel like we only got a small piece of fall – summer ran long, and winter is early. I would rather take the treadmill than risk a fall too. Treadmill runs always go by faster with a workout built in, and even if I don’t have a pace workout, I’ll play around with the inclines just for something different. I did 25 miles this past winter and really hope I don’t have to repeat it! Exactly! Treadmill is just going to be a way of training for me this year….I’ll try out playing with the incline too! It was (almost) miserable in Iowa last week. So cold!!! Granted, I’m not running heavy miles right now (and am doing a lot of walking, which is usually “colder” than running), but ugh. I want it to be about 20-degrees warmer for a few more weeks. 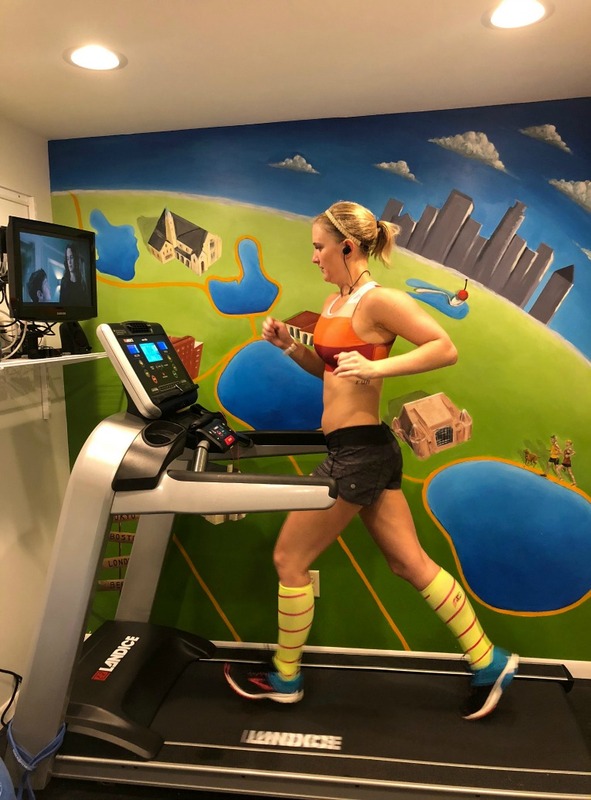 That mural on the wall by your treadmill is neat!! Walking Matilda (our dog) is tougher than running! So cold. But I’ll take the cold while running if only the trails were clear…which they were not most of this week. Thank you for the nice words about the mural! My friend painted it- it’s a ‘map’ of our running routes, including our house, our run club, the church we got married in, and more fun landmarks! I’d definitely be cautious about running after your experience — you certainly don’t want to repeat. You have a sweet set-up with your treadmill. I love the mural on the wall too. I went to a Diwali party but it was a bit more low-key (no shots!). My friend hosting wore her sari though – so gorgeous. Thanks Coco! I love that mural as well. Makes me never want to move! 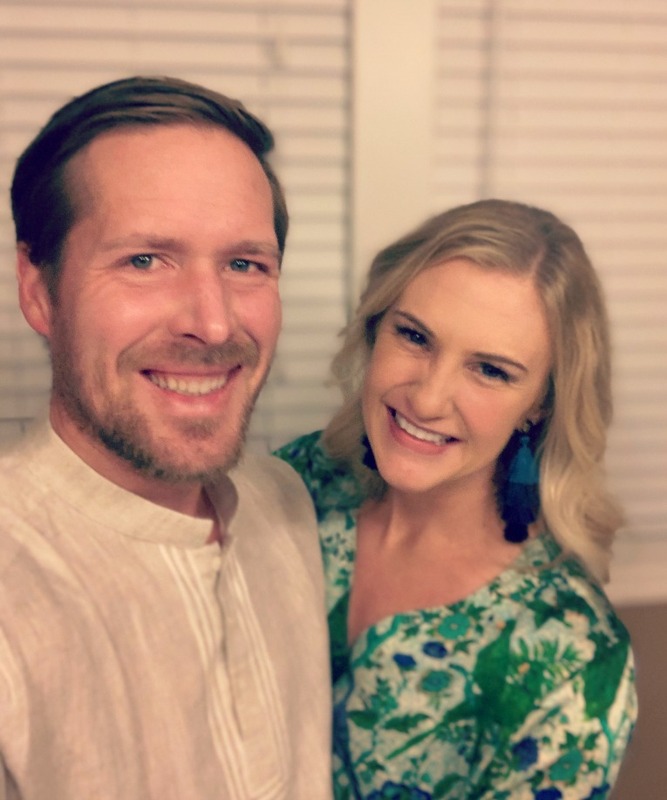 There were a lot of saris at the Diwali party, but I only bought kurti’s in India, so that’s what we wore! 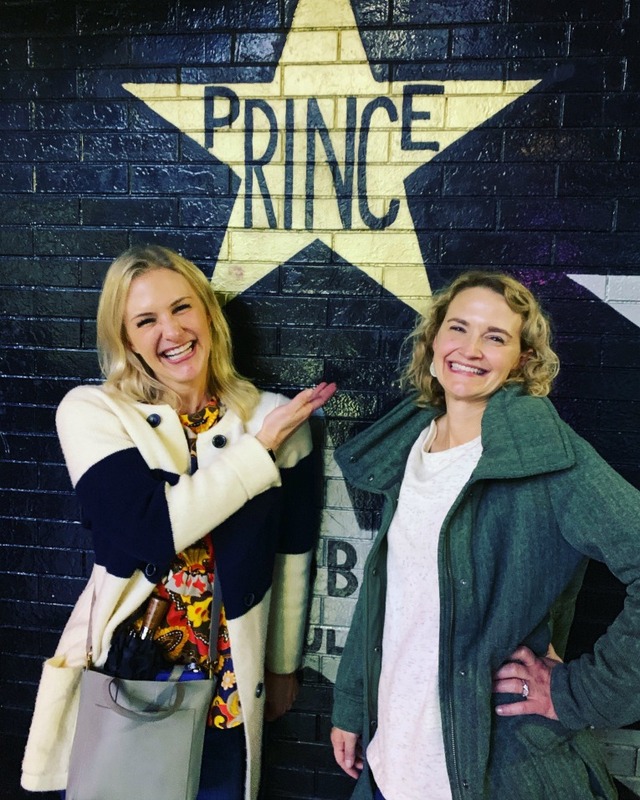 And, you have a lovely mural on the wall beside you! I certainly wouldn’t take any chances with running on slippery ice. It sounds as if you’ve got some good option for staying occupied on the treadmill. The Diwali party looks fun! Thanks for linking! I just love that mural on the wall next to your treadmill! I’ve tried to jazz up my treadmill area and it helps, but nothing compares to running outside. I sure get why you are so cautious, tho. The last couple of winters brought black ice and I had more than my share of close calls. Grrr. Nothing compares to running outside, but nothing is as bad as NOT running due to a broken leg! So the treadmill it is. I have a bit of post-trauma anxiety…treadmill will be my best friend this training season. So glad you drop links to your prior posts, I sometimes (OK almost always) miss checking in during the week. And wasn’t following you for your time in India. Thanks! India was a fabulous experience, I really enjoyed it. My friend painted the mural, it’s a little map of our city with all our favorite landmarks! It really means a lot to us. Oh what a wonderful idea/tribute to your city. Thanks 🙂 I guess it means we are never moving! I so feel you on the treacherous conditions. No shame in the mill at all. I enjoy my mill setup as well. I think it’s awesome to have the mental flexibility to be able to go between mill and roads. Wow Houston is sneaking up fast! Thanks Marcia- it’s still running, just not quite the same social part as running with friends, but I’ll take what I can, if its safe! Great job getting miles in on the treadmill. You have such a great setup for it! I have a lot of treadmill days in the winter, too. I find I do best watching sports, but also suspense/thriller movies. One time, The Fugitive happened to be on TV– I don’t think I’ve ever run so fast! haha It was like I was trying to match the pace of Harrison Ford! I plow through a lot of Netflix 🙂 But its fun to get sucked into a show and ONLY watch it on the treadmill, it’s motivation of sorts! Oh Brrr! I’m in upstate NY, but thankfully it hasn’t been that bad yet. I’ve heard good things about the Hill Haunting (whatever) series. I also have a large flat screen tv by my treadmill, but I still can’t imagine doing a long run on it. You do what you gotta do though! Sounds like a pretty good week to me.15 miles on a treadmill is no joke! That is definitely a strange one..a torn calf muscle from the treadmill?? Yikes. Were you changing your form a lot? Yes, and looking back at some pics for my coach I had v poor form anyway then, and I ran long on the treadmill and only on the treadmill then went pounding off down the road. Not a common thing, as I said! Today is our first day of wintery weather. This morning we got about three inches of snow, but it’s just turned over to rain. Most of the roads haven’t been plowed and in typical fashion the DC area has been brought to its knees. LOL Our trails typically don’t get plowed so once it snows they can be off limits for a while. Yes, good eye Debbie! That is Dustin, Tilda, and I on a run around Lake Harriet 🙂 Hence why we can never move…someone else would paint it over and it would make me so sad! Bummer that your trails aren’t plowed but I supposed it’s not generally an issue in DC…hopefully you can run them again soon! Thanks Kelli! I am tempted by those magic number tights too…glad to hear you like them! 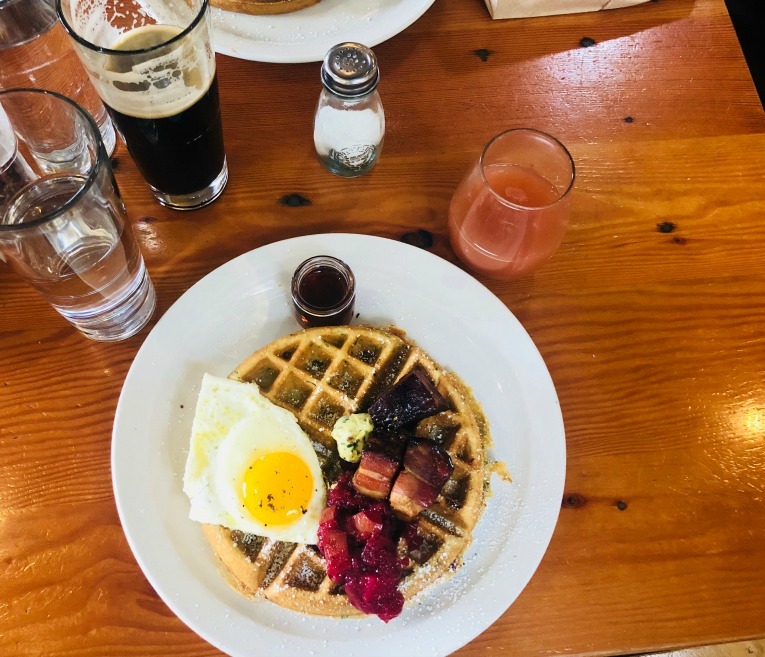 The waffle is amazing, if you come to run TCM, definitely stop at Birchwood for a post race waffle 🙂 I’m blanking if it was dates or figs…they switch up the toppings a bit with the seasons.